A self-driving Uber SUV struck and killed a pedestrian on a street Sunday in Tempe, Arizona. It's believed to be the first fatality involving a fully autonomous car. Here's what you need to know about the crash, Uber's autonomous vehicle testing, and what's next. 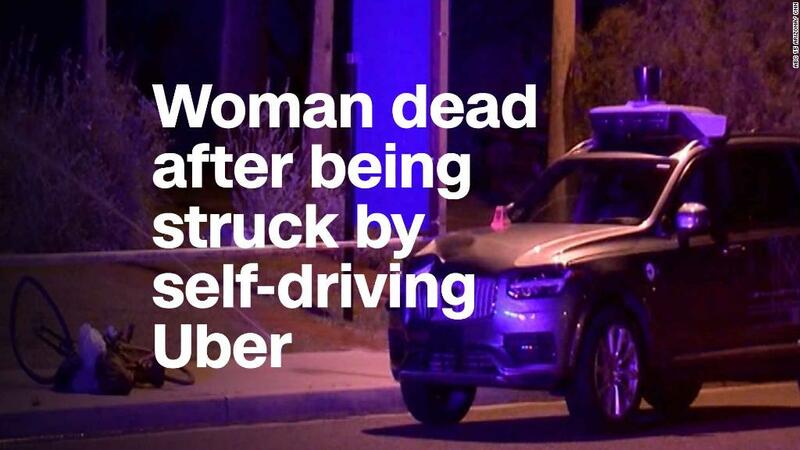 A self-driving Uber Volvo XC90 SUV killed 49-year-old Elaine Herzberg as she walked her bicycle across a street in Tempe, Arizona, Sunday night, according to the Tempe Police Department. Rafael Vasquez, a 44-year-old test driver from Uber, was behind the wheel of the car at the time. The department is investigating the crash. Police say the investigation so far does not indicate the SUV slowed down before hitting Herzberg. Why was there a driver behind the wheel? The car was in autonomous mode at the time of the crash, police said. There were no signs Vasquez was impaired after the collision, Sgt. Ronald Elcock, a Tempe police spokesman, said in a press conference. Uber said it has stopped testing self-driving vehicles throughout the United States and Canada. It's currently conducting autonomous vehicle tests in Arizona, Pittsburgh, Toronto and other areas. In a statement, Uber said it is "fully cooperating" with local officials. "Our hearts go out to the victim's family," the company said in a statement. CEO Dara Khosrowshahi reacted on Twitter. Which authorities are investigating the crash? In addition to the Tempe Police Department, the National Transportation Safety Board said it is launching an investigation. The Maricopa County Attorney's Office will ultimately determine whether any charges will be filed in the crash. Why did this happen in Arizona? Arizona is an incubator of self-driving car tests. Earlier this month, Arizona Governor Doug Ducey updated an executive order to allow self-driving cars to drive on state roads without a test driver behind the wheel. Arizona has little inclement weather. This makes it more appealing for self-driving cars, which have less experience in rain or during snowfall. Who else is testing self-driving cars? Waymo, the self-driving arm of Google's (GOOG) parent company, is launching a public self-driving car service this year in the Phoenix, Arizona, area. Companies such as GM's (GM) Cruise and Intel (INTC) are also testing in the state. Many self-driving companies have circled 2020 as the date when self-driving vehicle technology would be deployed on American roads.